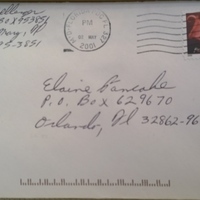 An envelope sent from A. Dellinger to Elaine Pancake, the customer relations coordinator for the Downtown Orlando Post Office, located at 51 East Jefferson Street in Downtown Orlando, Florida. This particular post office was constructed in a Spanish Colonial Revival style from 1939 to 1941 and dedicated on April 14, 1941. It has been occupied by the United States Postal Service since 1941, the Federal District Courthouse from 1941 to circa 1974, and the office of the Roman Catholic Church since 2003. 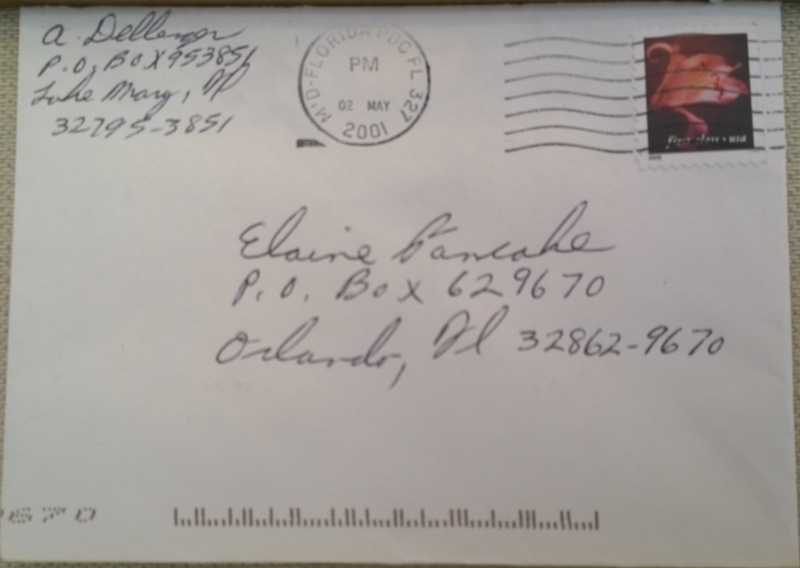 Original envelope from A. Dellinger to Elaine Pancake, May 2001: Orlando Remembered Exhibit, Downtown Orlando Post Office, Downtown Orlando, Florida. Digital reproduction of original envelope from A. Dellinger to Elaine Pancake, May 2001. Originally created by A. Dellinger . Kilsheimer, Joe. "Old Post Offices Aid Revitalization Efforts". AMERICAN CITY AND COUNTY. 119: 20-21. Dellinger, A.. “Envelope from A. Dellinger to Elaine Pancake.” RICHES of Central Florida accessed April 25, 2019, https://richesmi.cah.ucf.edu/omeka/items/show/5584.